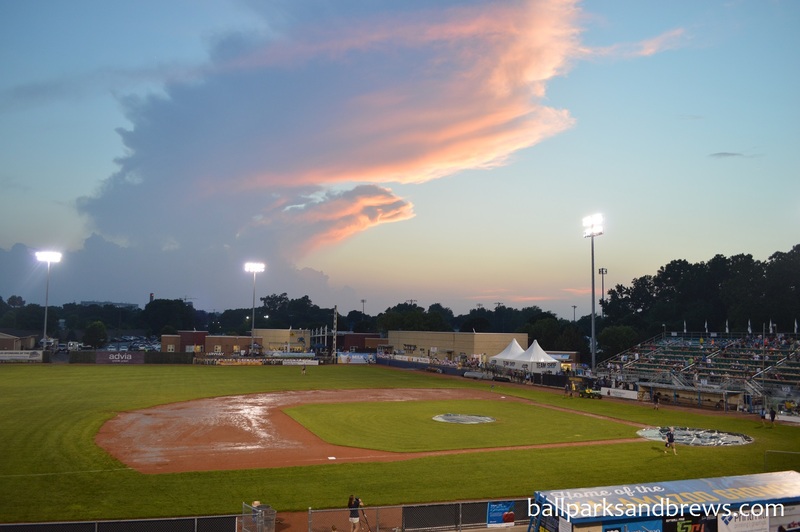 Ballpark Basics: A baseball team named after a beer vessel, and a great job during rain delays. What’s not to like? Just before the start of our game the skies opened up and a midsummer thunderstorm pushed back the start of the game. However, the team did a great job of entertaining the fans during the rain delay making it a much more enjoyable experience. 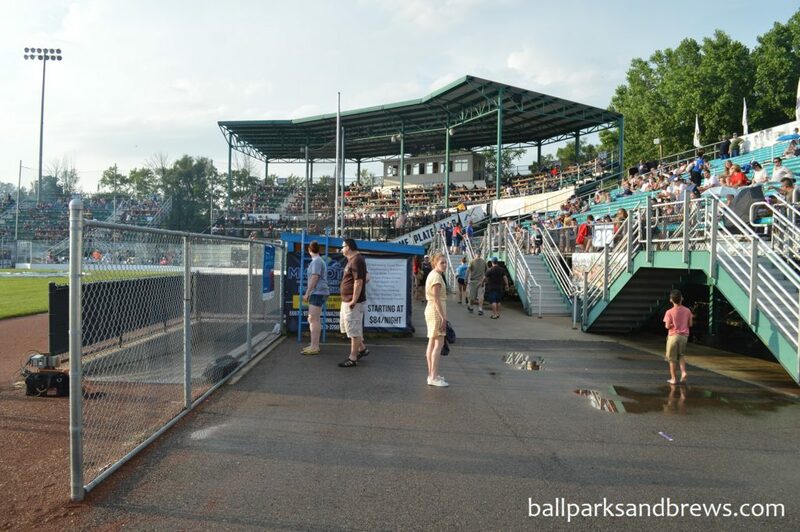 It gave us time to explore the ballpark and appreciate the atmosphere created at Homer Stryker Field. The seating in the grandstand is broken up into different categories, home plate club and suite seats, etc. 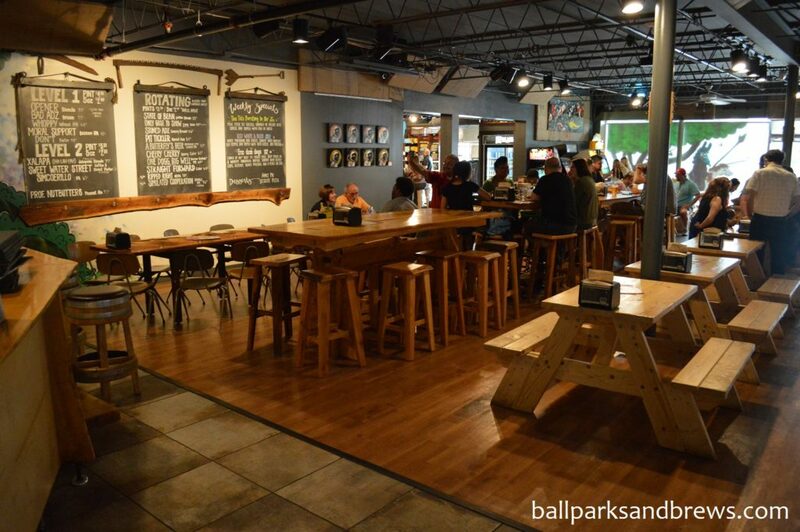 The home plate club includes granite tables and 4 seats that came from Oriole Park at Camden Yards. We lucked into suite seats which make up the upper part of the grandstand. This included more of your typical ballpark seating. However, there was a railing in front of the seats for your food and beverages. This came in handy since the ticket included unlimited food and three drink tickets. There were a set of bleachers down each baseline, with the first base line also having table tops in front of the seats. The Growlers really want to make sure that you have plenty of room for their numerous food and drink offerings. Best Spot for Beer: With a team named in honor of the local breweries (and the local black bears) you will not be disappointed with the beer options for a Growlers game. When entering the ballpark you come upon the Bell’s Bear Cave. We immediately thought this would be our go-to beer spot. However, it is a suite that can be rented for the game and only open to specific pass holders. With our suite seats we were able to head under the third base bleachers for food and our allotted beer. They had both macro and options from Bell’s. However, the best spot for beer would be the beer cart that was on the concourse behind the first base side. 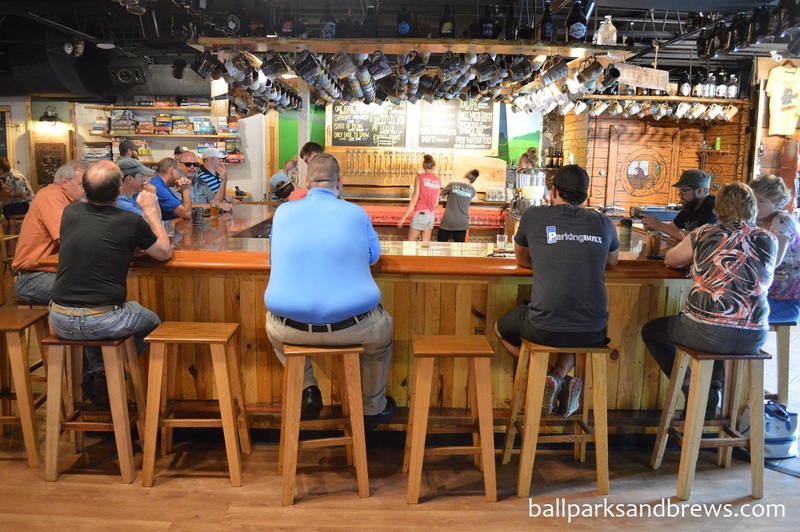 Here they had multiple local options including the Northwoods League signature beer, Five Tool Ale from Rustic Road Brewing. 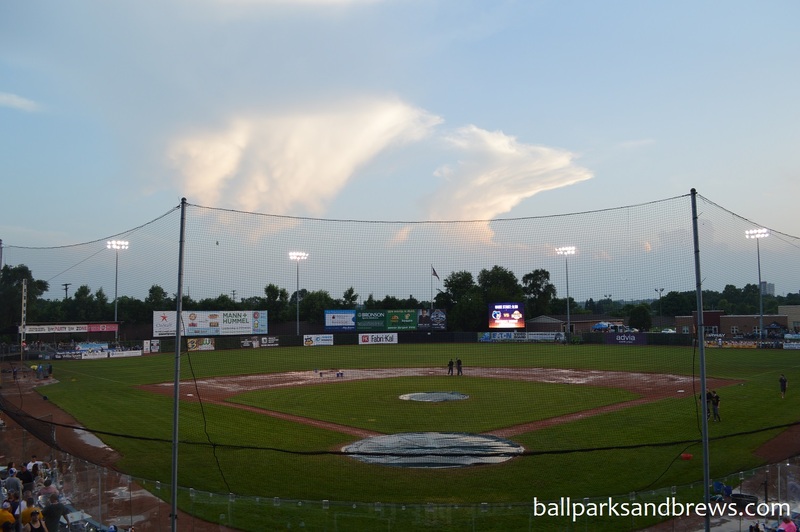 Throughout the rain delay the announcer (as well as members of the team) kept the crowd engaged and occupied by playing different games (and promising that the fireworks would still go on). We ended up having such a good time it made up for the fact that they never even got the game in. 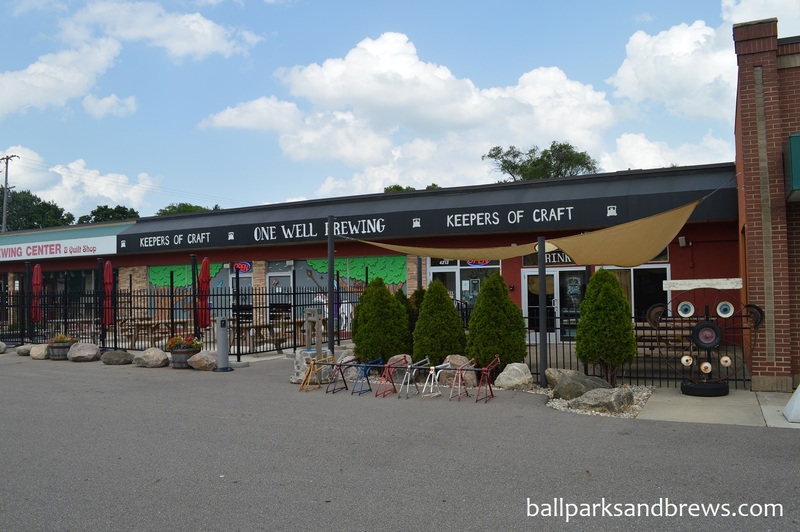 Kalamazoo has already established itself as a great beer town and we learned that it is also a great baseball town. Beer Basics: A direct recommendation from local beer aficionados when our first plan got, um, derailed. Pit Tickler Apricot Pale (5.1% ABV): Pale white-yellow color that’s hazy with lots of lacing. Smells yeasty and apricot centered and that conveys in the palate as well. Slightly wheaty, solid stone fruit notes but not too fruity. One Dogg Bigg Well (6.0%): A collaboration with Gonzo, the One Dogg pours golden, peachy yellow. Like the Pit Tickler lots of lacing but the palate is cleaner, more of a blended hops with a slightly sour hop bite at the end. Simulated Cooperation DIPA (9.6%): Lighter golden, slightly brassy in color, also with long lasting lacing but no visible effervescence. The flavor is actually quite puckery tart that builds until swallow, but then sweet, juicy and alcoholic boozy after. Stone Adz Cherry Brown (5.6%): Chestnut brown color and happily, no artificial cherry flavor. Just a pleasant carmel and tart cherry blend of flavors that are light but strong. Though it smells oat malty, the cherry flavor is what lingers at the end. Sweet Water Street (7.1%): A special “coffee & donut porter”. The Sweet Water was a black porter color that honestly smelled like coffee and jalapenos. Definitely has a spicy kick at the end, and we never found the donut aspect. Not bad, but not as expected.